How did things turn so bad so fast at the Portage Theater? It took more than three years for controversial venue owner Erineo “Eddie” Carranza to frustrate Ald. Proco “Joe” Moreno and anger Logan Square residents to the point where they have dragged the troubled Congress Theater into “Deleterious Impact/Public Nuisance” hearings with the city. It took only three weeks from the time Carranza bought the Portage Theater to similarly turn residents of Six Corners and Ald. John Arena against him. On Friday, Carranza served a five-day eviction notice to the much-loved current operators of the Portage, who have for years offered an eclectic bill of independent films at the 1920s-vintage theater. In the process, however, they have fallen $103,000 behind in rent payments while making what their supporters say were costly repairs to the venue that should have been done by the former owner but which were urgently needed to keep the venue viable and open to the public. Supporting a group of admired local businessmen and eager for the Portage to continue presenting the sort of fare it has been showcasing, the powerful Old Irving Park Association and Ald. Arena already fought a bitter public battle earlier this year with one prospective buyer, the Chicago Tabernacle, successfully convincing the church to withdraw its bid for the venue. Current Portage manager Dennis Wolkowicz and his business partner Dave Dziedzic then put in their own bid to buy the theater—but they lost out to Congress owner Carranza, who paid some $3 million for the venue, closing on the deal on Sept. 1. Wolkowicz and Dziedzic have a lease that runs through 2015. But on Friday, Carranza and his attorney Thomas Raines sent the eviction notice that they’re out unless they pay the back rent within five days. This came only two days after a meeting on Wednesday where Raines repeatedly assured the venue managers and Arena that Carranza would not pursue an eviction. Since this blog broke the news of the eviction notice Saturday evening, public outcry from area residents and Chicago cinema buffs against Carranza has been vociferous, with dozens of comments on Twitter, Facebook, and many corners of the Internet. What happened between Wednesday and Friday that made things unravel? Pressed several times to be more specific, Raines maintained that more details would come out “in a bigger publication” soon. “I have no idea what ‘troubling’ thing happened and no idea what [Raines] is talking about,” said Owen Brugh, Arena’s chief of staff in the 45th Ward office. Brugh said Arena called the meeting to facilitate communications between Wolkowicz and Dziedzic and the new owner of the theater in a contentious situation where everybody had different but compatible goals. Wolkowicz and Dziedzic want to continue offerings films at the Portage and have the liquor and PPA licenses to do so. Carranza now owns the Portage but is unlikely to get city licenses given his current troubles at the Congress. 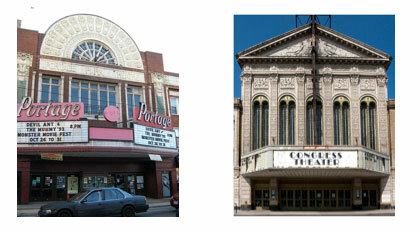 Arena wants the Portage to continue as a cultural center contributing to the vitality of the Six Corners redevelopment. “It seems like all of these people should be able to work together,” Brugh said. Nevertheless, the five-day eviction notice went out, and Carranza now has a fight on his hands with another city alderman and another set of neighbors four miles northwest on Milwaukee Avenue from the battle he’s fighting at the Congress. “Eddie wants to keep the cinema aspect there, and he wants to keep Dennis there,” Raines said. “I can give you all kinds of business and financial reasons why they need to be evicted, but I won’t get into it because I’m sure you can figure those out. They owe a ton of money in back rent. But there were a few things that happened in the meeting Wednesday that make it impossible for us to deal with this alderman. It’s not, ‘Oh, we don’t like the way he looks’ or ‘We don’t like the way he acts.’ It’s way beyond that and we just can’t do it. Arena’s statement to the community indicated that, to the contrary, “I will encourage the current operators to explore their legal options [and] I expect they will operate in the theater until all those legal options are exhausted... We still have options as a community, and my office will continue to explore all available avenues to ensure that the Portage Theater meets its potential as an economic engine at Six Corners. Wolkowicz and Dziedzic could not be reached for comment. And no, Carranza replacing Doejo with chef Nick Lacasse for his partner on the foodie/storefront development end of things (here is Chicagoist on that) probably is not enough to make the hearing process turn in his favor.